Clodo Review 2019: Is Clodo a Good Hosting? 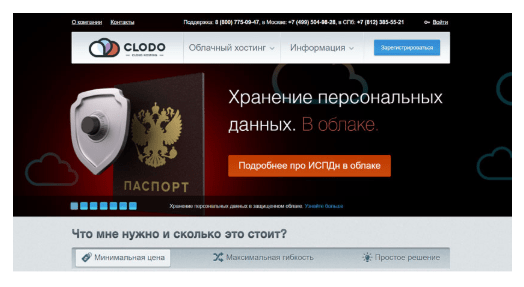 Clodo offers SSD storage and a 99.9% uptime guarantee for servers in Russia. Although the capacities are high, webmasters running mid-size websites may struggle to find a suitable mix between memory, storage, and CPU cores. 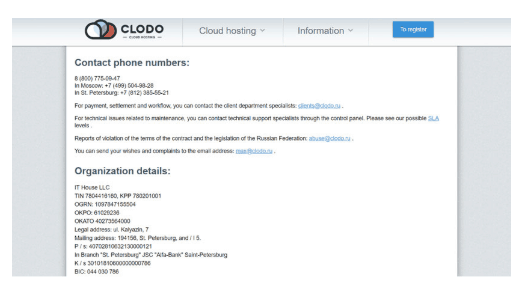 Clodo is a web hosting company offering cloud-based VPS and 1C-Bitrix hosting plans. Its servers are located in Russia in both Moscow and Saint Petersburg. Support is Russian language only. Webmasters with a large volume of traffic from Russia can benefit from a choice between the data centers in Moscow and Saint Petersburg so they can be as close to their target audience as possible. Advanced webmasters can also benefit from the ability to scale their memory and storage capacities to meet their needs. Unfortunately, there are no software auto-installers available. Beginning webmasters looking for help with the initial building and setup of their websites will need to look elsewhere. Interestingly, the regular and 1C-Bitrix Linux plans are priced identically. Clodo gives you the option to choose memory and storage capacities separately and according to your needs. That freedom does come with a small caveat — the storage can be limited by the amount of RAM. In addition, the number of CPU cores is determined based on the memory and storage capacities you select. Pricing relative to competitors is about average. Large webmasters will benefit from the high limits — 32GB memory, 200GB storage, and 14CPU cores. But some mid-tier websites will probably find the inability to choose the number of cores too restrictive because it will offer either too few (causing poor speed) or too many (paying for extra you don’t need). That said, if the specs meet your needs then this could be a good option. Support options are above-average. Technical support is available around the clock. I called Clodo’s support hotline and was able to get through to a representative on the first try during normal business hours. There are also email and ticket support options available. However, there is no live chat. Clodo offers very high resource capacities and a 99.9% uptime guarantee. However, the lack of flexible CPU core options may turn some mid-sized websites away. Wondering how Clodo stacks up against other Web Hosting companies? Enter any other Web Hosting company and we will give you a side-by-side comparison.